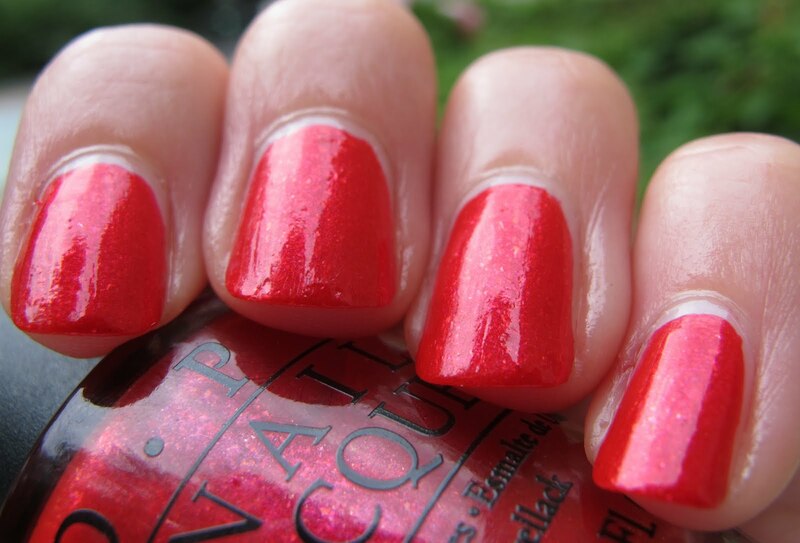 Never Enough Nails: OPI Finishes Up Strong with The New (and final) Glam Slam! 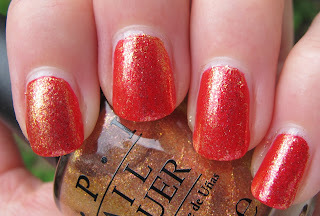 OPI Finishes Up Strong with The New (and final) Glam Slam! 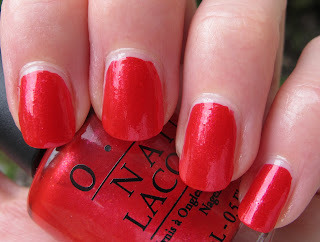 Sadly, we've reached the end of OPI's Serena Williams Glam Slam! duos. On a happy note, the last of the duos absolutely ROCKS!!!! This duo is available this month to coordinate with the US Open, taking place in New York. 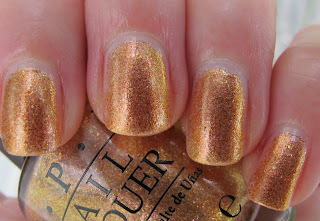 This may be my favorite of the OPI Glam Slam! duos, and I have really loved the others! I'm only missing the first one, Simply Smashing and Black Shatter. I couldn't find it anywhere when it was released. Anyway, on to the pictures!!! 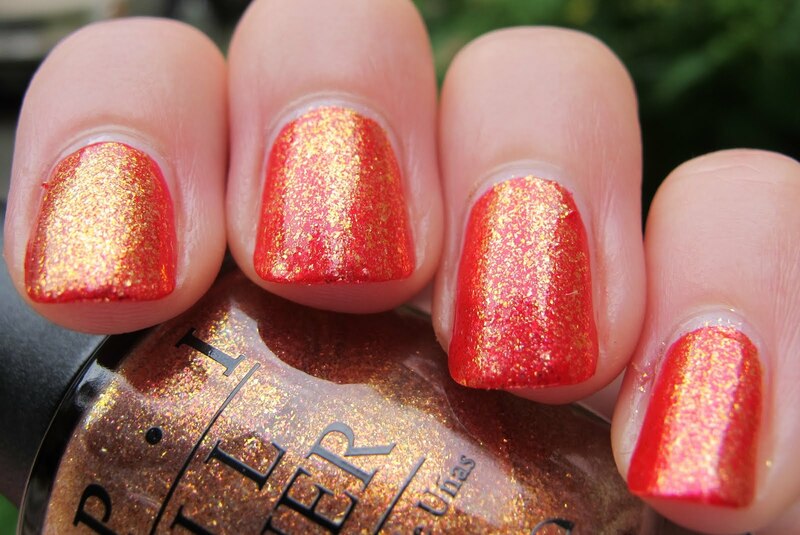 OMG THIS POLISH IS SO GORGEOUS!! Pros & Bronze just entered my Top 10 for 2011 list, probably Top 5. 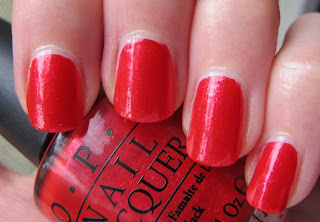 This is one seriously awesome polish, thank you OPI! 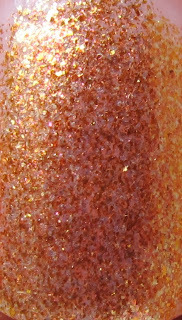 Pros & Bronze is a bronze foil packed with pink, gold, bronze and iridescent particles. These particles make it look kind of duochrome-like at times, flashing pink, gold and bronze. It is totally unique in my collection. 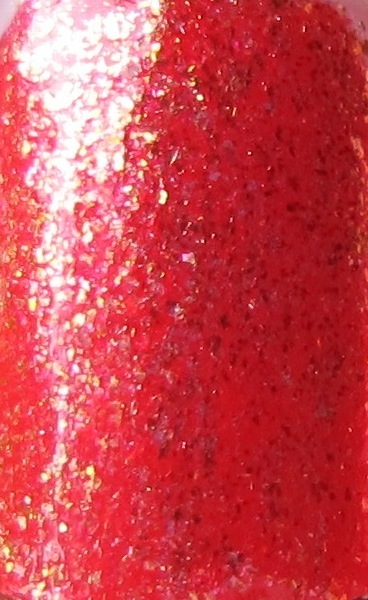 This is one of those cool polishes that you can really see every single particle that makes up the color. See my macro shot to understand what I mean. 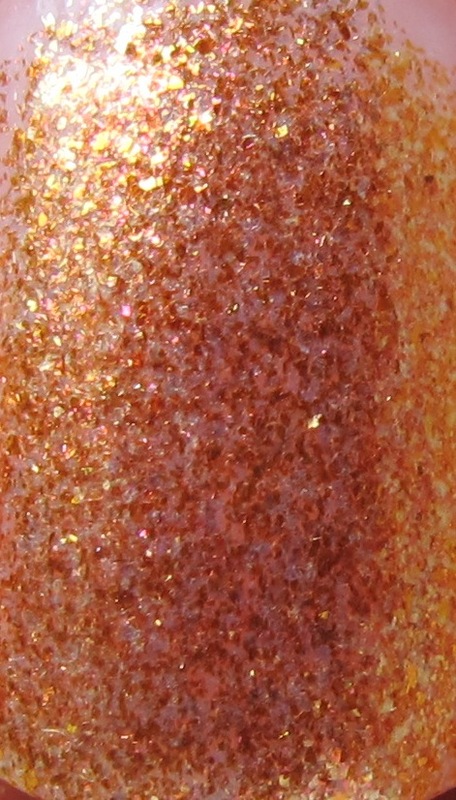 This looks like glitter from a distance, but it is quite smooth and flat. You glitter haters will probably appreciate this as a way to get the look of glitter without the PIA! Removing this was cake, unlike glitter. 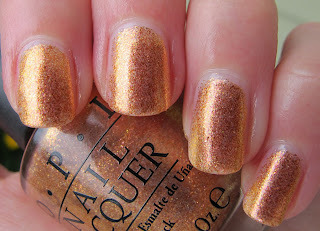 This one was a little sheer, this is four coats (and worth every coat). 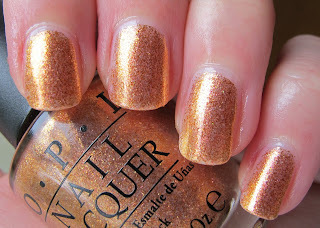 When I did my right hand to wear this as a full mani, I only did three coats and it looks fine. I just wanted it to photograph well, so I did the extra coat. Aside from needing three/four coats, the formula on this was excellent. Foils sometimes can be patchy, but not this one. Pros & Bronze dries pretty quickly too, so three coats isn't a bother. Look at how shimmery it is indoors and in low light (below)! And make sure you click to enlarge my macro shot!!! Drooooool! Next up is Love Is A Racket. This is a really BRIGHT maraschino cherry red with flakie glitter!! 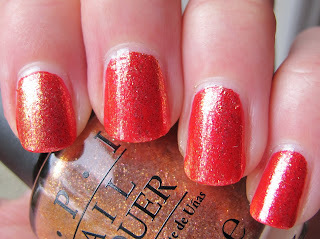 I'm telling you, all you need to do to sell me on a polish is say "flakie glitter" LOL. This was a bit hard to capture on camera, it's much brighter and glitterier in person. I really love this polish, the color and the fact that it contains flakie glitter. Love Is A Racket had a nice smooth formula. I have no complaints about application. 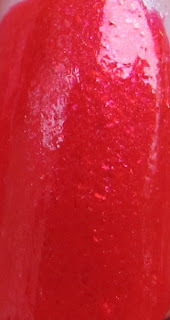 This is three coats, although I would probably wear two on shorter nails/if I wasn't photographing the polish. The press release for this duo mentioned the idea of layering Pros & Bronze over Love Is a Racket, so I took some pictures of that as well. This is amazing looking! I highly recommend trying this if you buy the duo. I did a heavier coat on my index finger and lighter coats on the others. This is just one coat of Pros & Bronze over three coats of Love Is A Racket. Glam Slam! U.S. will be available beginning August 2011 at Professional Salons, including Beauty Brands, Beauty First, Chatters, Dillard’s, JCPenney, Pure Beauty, Regis, Trade Secret, and ULTA. I hear it's already been spotted at Ulta. I predict this set will sell fast, so grab it now! 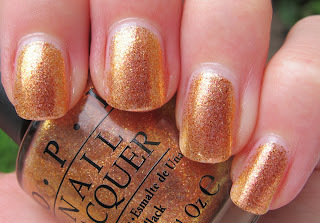 These polishes were sent to me for review by a PR agent for OPI. For more information, please see my Disclosure Policy. Glad you got them Jenna! They're excellent, aren't they? Those are so pretty! I saw this at my ULTA, may have to go get this after PayDay! I have been waiting for someone to point out the flakies in Love Is A Racket! I was beginning to think I was going crazy because everyone was just calling it a glass fleck. Both polishes look great! Sally Hansen Ruby Rush Rocks My Fall! Color Club Beyond the Mistletoe Preview! Sally Hansen Salon Effects for HALLOWEEN! 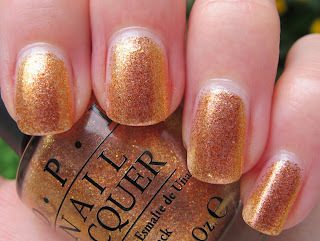 OPI Touring America Fall Collection Part Two! !